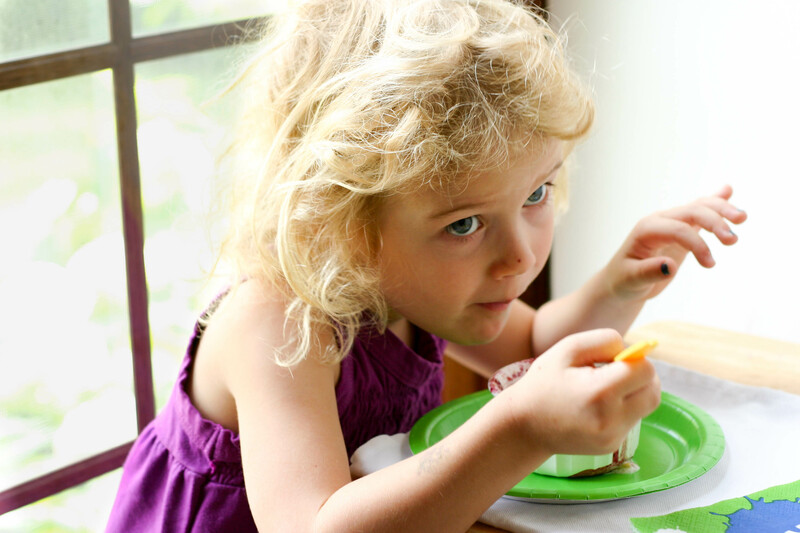 Anyway, as many of you may remember, the kids get to request a special birthday meal and dessert as part of their birthday celebrations. Mr. N requested Sesame Chicken and his rather elaborate homemade birthday cake. Well, Miss A took it a little easier on me this year. She wanted pasta in a cheesy sauce and a cherry crisp. Pasta sauce and pies/crisps are totally in my wheel house. They are the two food groups that I LOVE to cook and often do without a recipe. They are totally in my comfort zone. Now being as how we had been on dessert overload at this time – Mr. N’s cake, Miss A’s Barbie cake, 4th of July cupcakes, a strawberry rhubarb pie and we even had some of the Romanian sugar cream cake around still then too – I wanted to go for something a little more healthy and with a few less servings. So Miss A and I whipped together some Individual Cherry Crisps. 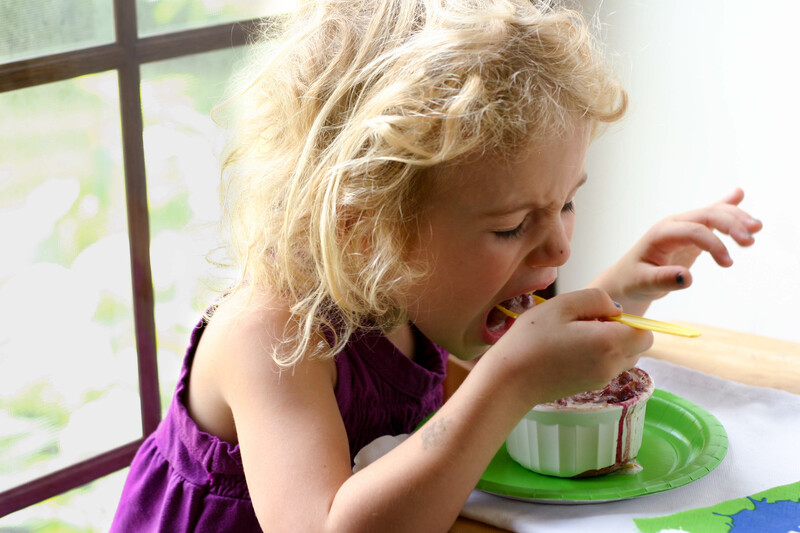 We started by greasing some ramekins with butter (Okay, so maybe it didn’t start out so healthy…). Next we pitted the cherries. 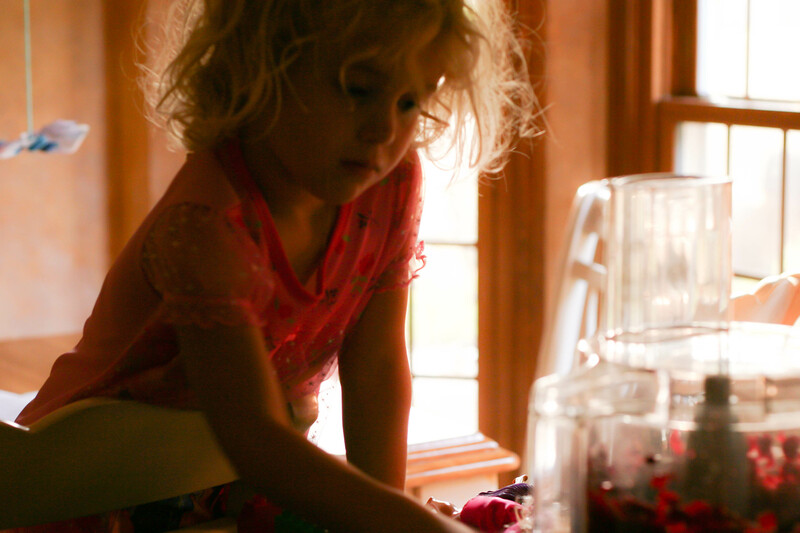 Then Miss A pulsed the cherries in the food processor a few times. 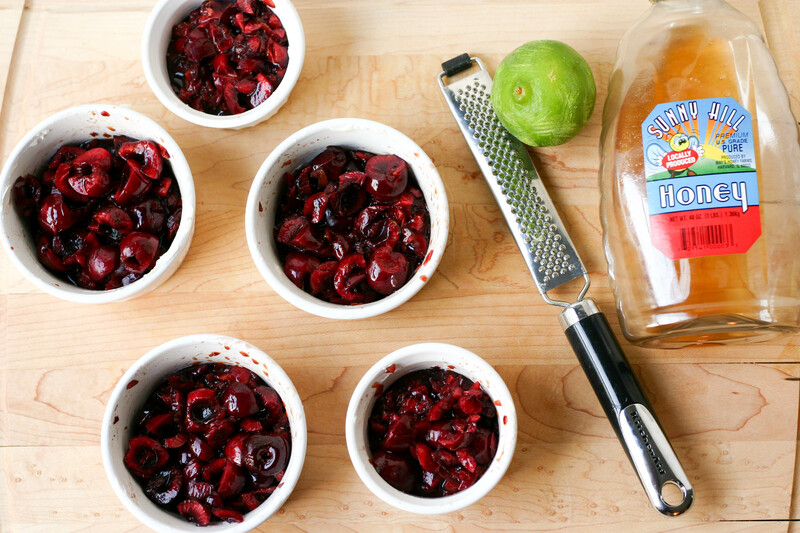 We mixed the chopped cherries with some honey and lime zest and spooned them into the ramekins. 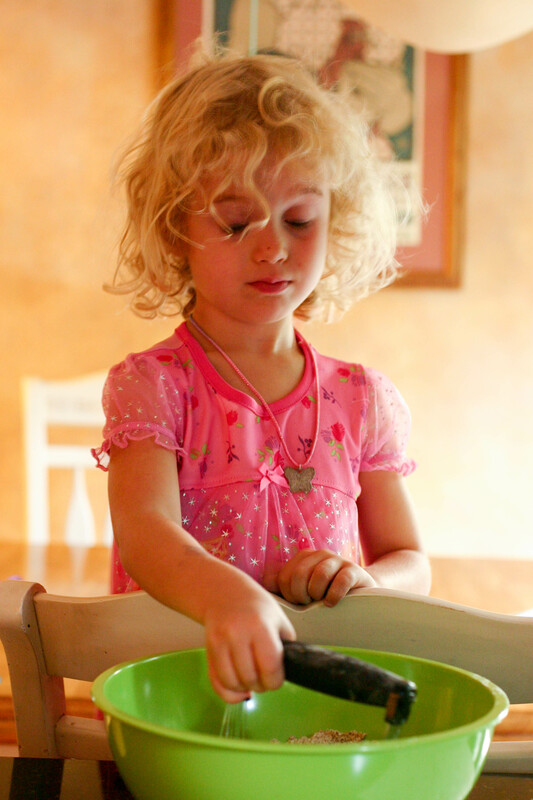 For the topping, Miss A used her trusty pastry blender (She’s so good she does this with her eyes closed now!) to mix together the oats, wheat flour, wheat germ, flax meal, brown sugar, baking powder and cinnamon. She also cut in a little butter for us as well. Finally we sprinkled the dry mixture over the cherries, placed the ramekins on a baking sheet and baked them at 350F for about 35 minutes. The beauty of these crisps – they are easy and can really be customized to suit individual tastes. You could opt for white sugar instead of brown, white flour in place of wheat, skip the wheat germ and flax meal, add a little vanilla in place of lime, etc. Trust me, it’s hard to screw up a crisp. We also had Mike make some fresh lime infused whipped cream to top our crisps. Mmmmmm! Mr. N and I gave them 3-1/2 spoons. He especially liked the whipped cream. Whoa Miss A! One year at a time. 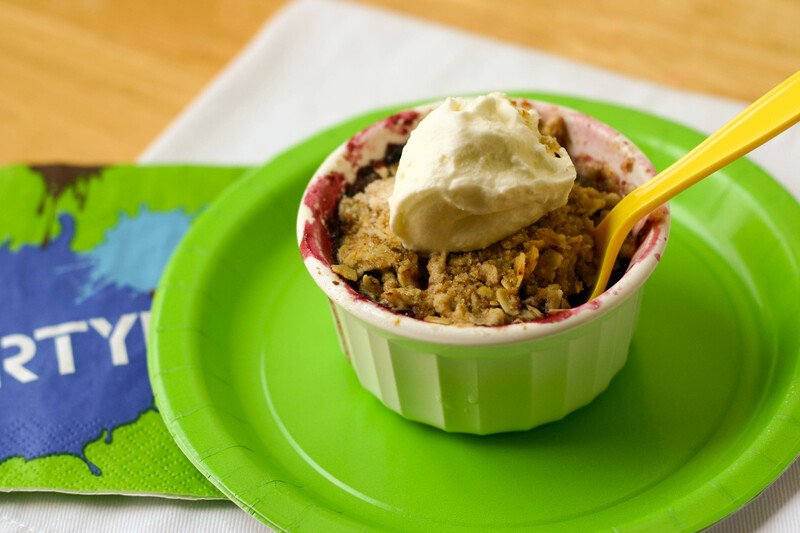 It’s already going way too fast…So for now, Miss A will stay four and give the cherry crisp 4 spoons too! We’ve got a few more special recipes before we head to our next country, and we’ll be back later in the week with one that’s fast becoming a favorite meal for Mike and I. Until, then we’re going to finish another celebration…Mr. N’s theatrical debut. (Yes, it’s been a busy summer!) Have a great week everyone! 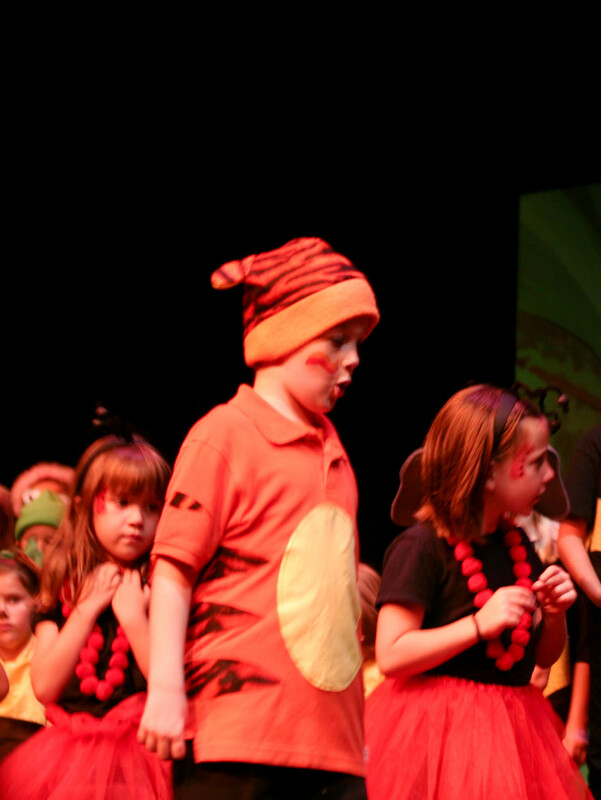 Mr. N as Shere Khan the tiger in The Jungle Book. 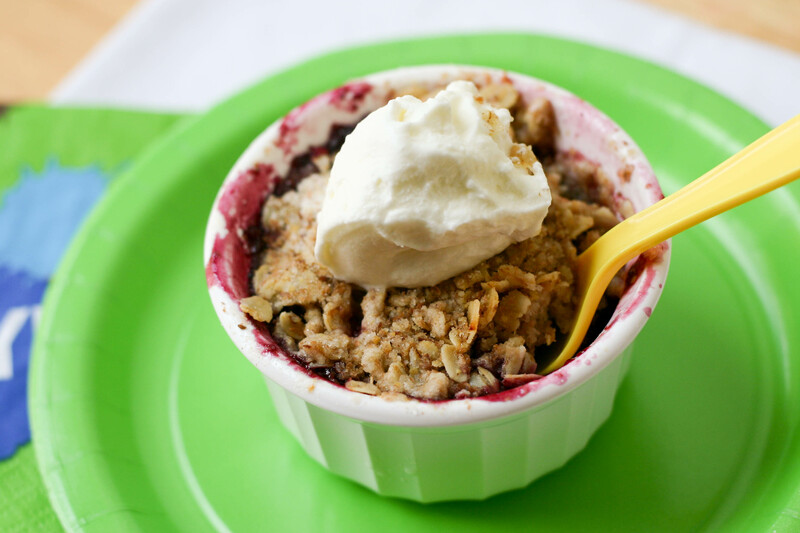 Oh my gosh, Kristy – we just made these tonight (subbing in blackberries and lemon zest for cherries and lime zest) and it was absolutely amazing! It was a good thing I only made one serving each for us, or it would’ve been a gluttonous event! 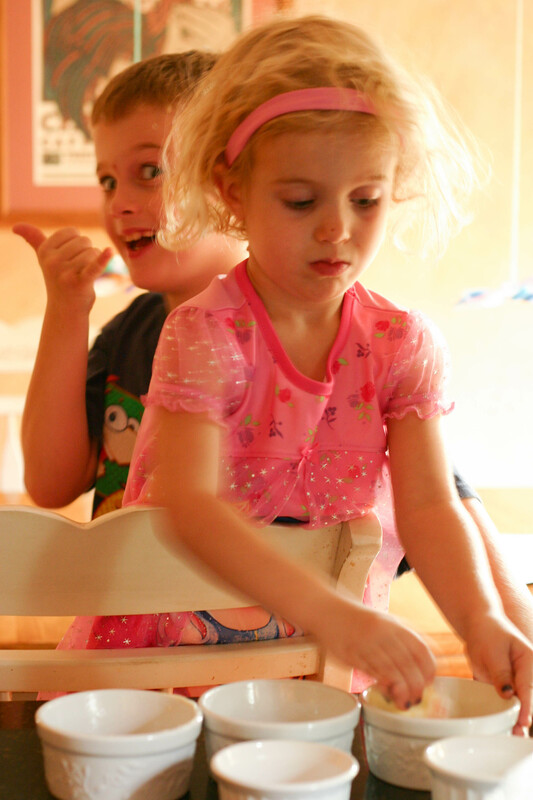 Hope you guys are doing well – I’m thinking I should be back this week, once I get my oldest off to kindergarten! I’m so glad you enjoyed these. And blackberries sound fabulous. I’ll have to whip that up sometime. 🙂 Can’t wait for you to come back Courtney! Good luck with the first day of kindergarten!!!! Hehee I love how Ms. A thinks that she’s going to be five soon. REALLY cute! Isn’t that great that they want to be older and want to age? I don’t even know my age anymore but don’t want to gain any more age or wrinkle or white hair! lol. I love the cherry crisp. Just finished a bowl of fresh raw cherries. I still have some left so I should make this! This is so cute! Your pictures are gorgeous! And this cherry treat looks so good, I need to make more things with cherries! I especially like the first photo – there’s a timeless almost ethereal quality to it; beautiful. Congratulations Mr. N on your performance in the Jungle Book – I know that you have been working hard in drama practise and I have no doubt that you were amazing on show day! Sounds like you and your sister had fabulous birthdays. You can sign me up for that lime infused whipped cream any day – how delicious!! Your kids are adorable! I love the cherry crisp! Looks so good. A perfect ending to your birthday celebration. Oh how fun! Yes good things do come in small packages. your post just made me smile and so thankful for the moments I spend with my children. I love the pic of Miss A eating her ice cream! Girl after my own heart:) LOL! I remember those days when my kids were younger, it seems like just yesterday. Birthdays were HUGE and so special, although they still are but just without the birthday parties. We’re in the midst of celebrating our kids as well. My youngest turned 23 on the first and my oldest 26 on the 17th. I’m making one big cake this week to celebrate both so I hope you’ll stop by to check it out. All your birthday dishes look delicious. 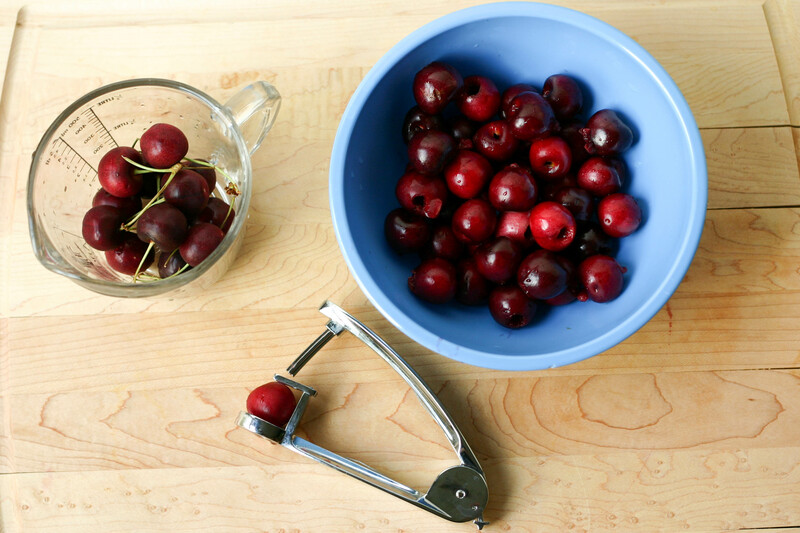 I love your cherry pitter! 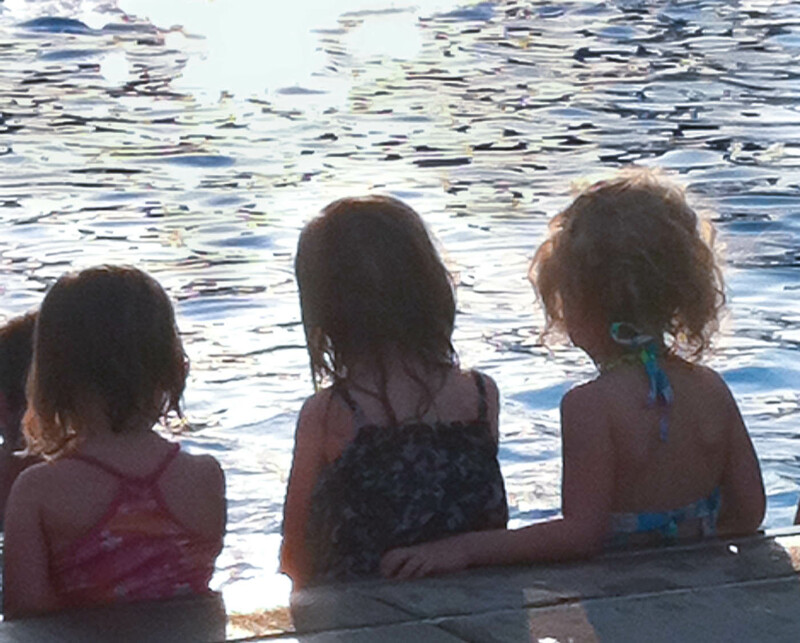 Summer is just not the same without little ones around!! I love that you share your family pics with us, it brings a smile to my face to see them having fun and being silly! Miss A is my kind of girl, Iove pasta too and the cherry crumble is awesome. Cherries were my dad’s favorite, so I would always try to come up with a dessert containing cherries for him. 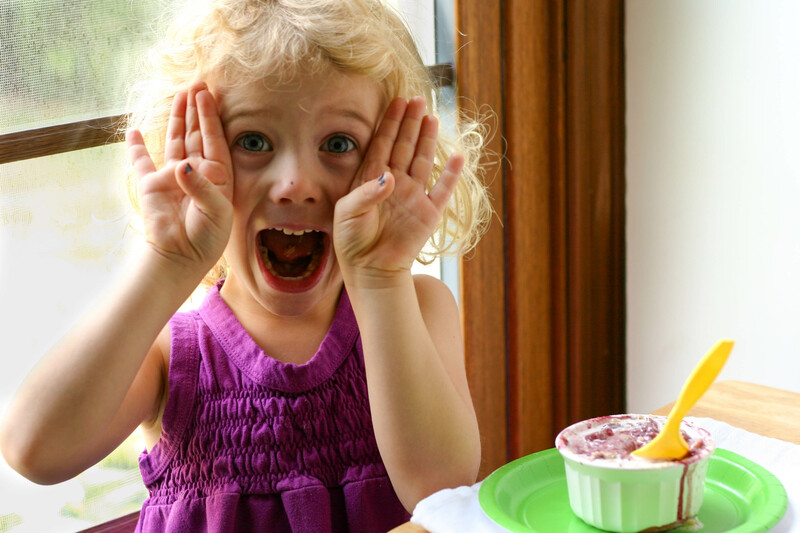 I’m always a fan of the individual desserts, helps to control 2nds (and 3rds) and always seems special, like a special dessert just for a 4 year old, soon to be 5…oh, boy!! 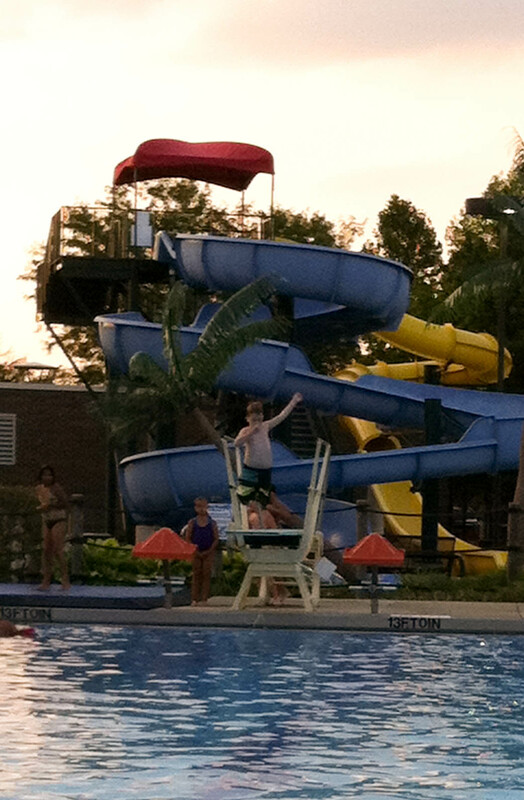 Great photos Kristy, I particularly like the swim lesson shot. 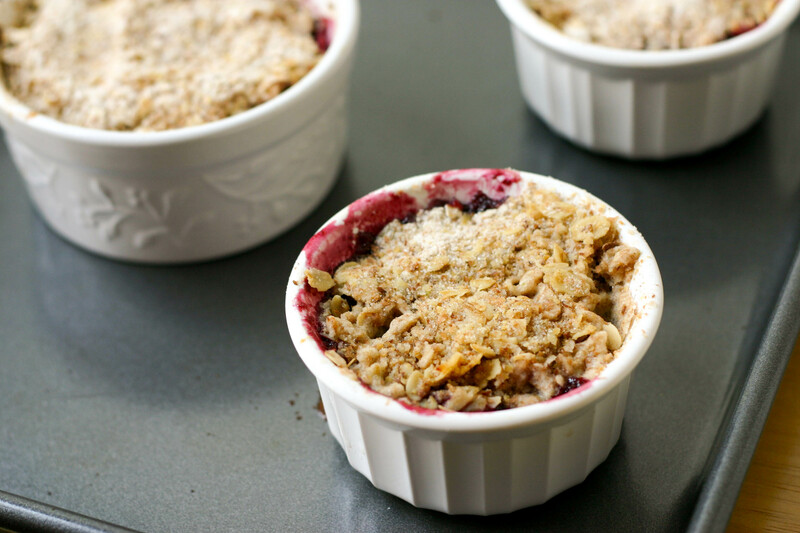 Cherry crisp sounds incredible! What adorable pictures!!! The crisp looks delicious, and nice job on getting out of another cake, even though you did so well last time! You have such a knack of taking the best angle and cutest photos of your children. This beautiful crisp has me drooling! We are approaching a birthday as well and the days are being counted down several times over any 24 hour period. Wonderfully fun! Great photo of the guy playing it up on stage too. What sort of play was it? Musical? Lovely looking dessert and that whipped cream on top looks fantastic. Ha, there’s no mistaking that hair, even from behind. Great photos. Looks like a great summer. 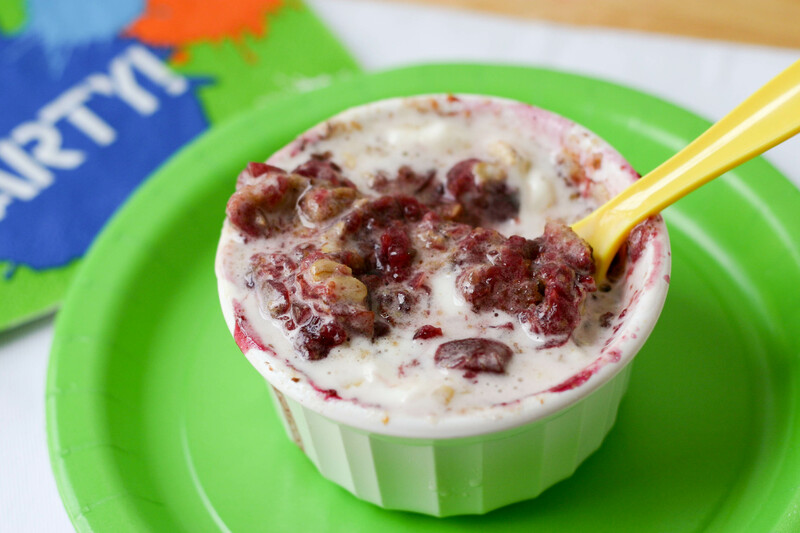 Love the ramekins filled with cherries as well. I made cherry crumble bars with part of the 11 cups of pitted cherries I ended up with. Yummy. I really liked your cherry pitter. It’s newer and snazzy compared to my trusty old tool which I adore and never fully appreciated before this. Look forward to the theatrical news. What a lovely post Kristy. PS. Sorry Mike that you only got one serving of this lovely pudding.